Has it really been 30 years?? Chris and I have been living in Gig Harbor for 8 years and our world is spent running between NASA gymnastics, the horse barn, St. Pat's and Bellarmine in Tacoma! Chris is still flying for Delta Airlines and I am a volunteer coordinator at St. Anthony Hospital. We love living in beautiful Gig Harbor and spend lots of time on the water!! I admit I was a bit skeptical about another reunion...but am now totally excited about it after looking at everyone's pictures and profiles!! It should be a blast! I love the memories of drill team practice and parades, Prom and Homecoming with Amy Faherty, graduation parties and somebody rolling down the hill in a sleeping bag (who was that??)... waterskiing with Peter and Paul... MANY adventures with Stephanie, German camp where we didn't speak German...SUPERTRAMP and Earth, Wind and Fire concerts...a great class of '79...! Chris and I with children Brandon, Abbey, and Madison. 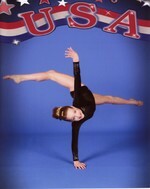 14-year old daughter, Madison qualified for the Jr. Olympic Western National Gymnastics Championship in Oklahoma. 12 year old Abbey riding her horse "Red". 17 year old son, Brandon diving in Cozumel.